Despite passage of the 2010 health care reform bill, employers continue to push for cuts in benefits and to shift costs to workers in higher monthly payments, co-pays, and deductibles. Wage increases are always trumped by this costly health care monster. Some employers, in anticipation of the $2,000 annual fine for not offering health insurance, are threatening to drop coverage and instead pay the cheaper fine. Many companies are dropping benefits for spouses, retirees, and part-timers. Current law does not stop them. Multiemployer plans are disadvantaged by the preferable treatment available to the plans of non-union employers. The 2018 excise tax will cap the ability to bargain better health benefits. Insurance companies continue to decide what doctors and hospitals workers can use. Unions are playing in a ball park where the odds are stacked against them, a field dominated by private health insurance companies. Unions need a new arena where they can win the battle, improve coverage, and secure it once and for all. Currently, nonunion employers undercut union ones by avoiding health care coverage. Ending this unfair advantage will be, like prevailing wage law, a crucial step for progress. With single payer, unions’ ability to win contract struggles will be enhanced. Now, for many unions, health coverage ends within 30 days of a work stoppage or lockout, placing outrageous pressure on workers to settle for less. With single payer, health coverage never ends. With single payer in effect, unions, including those with multiemployer plans, can use their health care bargaining power to improve pensions, sick pay, and other benefits as well as wages. Some union retirees currently have health benefits through VEBA’s. Many of these retirees are in jeopardy of benefit cuts due to rising health costs and limited VEBA funding. With single payer the problem is solved. Currently, many workers are fearful of organizing because they are afraid to risk losing health insurance coverage. That risk will be gone with single payer. Labor can win respect and gain support from those who are not in unions by defending not only its own members but by leading the fight for health care for all. In countries that have a form of single payer universal care, a higher percentage of the workers are in unions. In 2011, rates of unionization were: Sweden 67.5%, Canada 26.8%, United Kingdom 25.6%, U. S. 11.3%. Union members are not the only ones in jeopardy now. Our states and cities are strapped by the health insurance burden that siphons public funds from education, jobs, and all the beneficial programs we need. There’s nothing inevitable about the costly health insurance system we have in the U.S. where private insurance companies dictate what physicians workers can see and what claims to deny. In fact, the U. S. is the only major industrialized nation that doesn’t have some type of national, universal health care. According to President Bill Clinton, the U.S. could save $1 trillion per year by adopting the health system of any other advanced country. The U.S. spends about twice as much per person on health care as other industrialized nations, yet our life expectancy, infant mortality, and other outcomes fall short. 16% to 20% of the big private insurance companies’ premiums are wasted on marketing, CEO salaries, profits, paperwork and bureaucracy rather than health care services. Drug prices in countries with national health systems are a third to a half lower than in the U.S.
Over 30 million will remain without health insurance even when the health reform bill (ACA) is fully implemented. About 31% of U.S. health spending is on administration, most of it waste. Tens of thousands of Americans die every year because of no health care coverage, and millions more, including those with insurance, forego care because of the cost. Studies show a single-payer health care system would save $400 billion annually, enough to cover all the uninsured and to upgrade everyone’s coverage. Under our employer-based system, if you lose your job, you lose your health insurance too — just when you need it the most! More than half of personal bankruptcies are attributable to illness and medical bills. 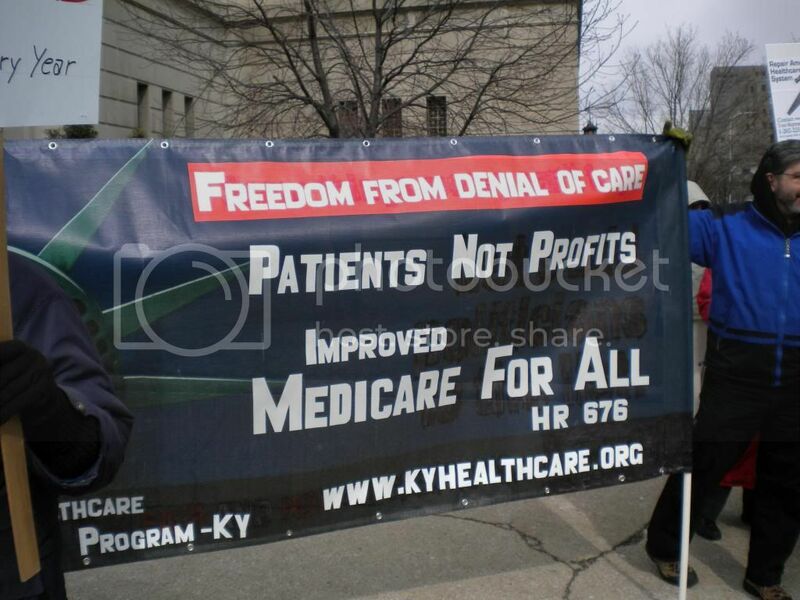 With single payer, each person chooses their physicians, other caregivers, and hospitals. Congressman John Conyers Jr.(D-Mich.) has introduced H.R. 676 into every Congress since 2003. This single-payer health care program proposes an effective mechanism for controlling skyrocketing health costs while covering all and improving health care for everyone. H.R. 676 would cover every person in the U.S. for all necessary medical care including dental, prescription drugs, hospital, surgical, outpatient services, primary and preventive care, emergency services, oral surgery, periodontics, mental health, home health, physical therapy, rehabilitation (including for substance abuse), vision care, durable medical equipment, palliative, chiropractic and long-term care. H.R. 676 ends deductibles and co-payments removing financial barriers to care. In country after country, labor took the lead in championing universal health insurance. Labor’s leadership is essential to pass HR 676. Some argue that labor shouldn’t advocate national health insurance because universal coverage would take away a major incentive for joining unions. But countries with universal health insurance have a far higher proportion of workers in unions than the U.S. Unions can gain better wages, pensions, and working conditions if they aren’t locked into bargaining to retain essential health care benefits. Some union members fear they would lose the level of benefits they’ve won if we had national health insurance. In fact, under the current system labor’s health benefits are threatened with every contract negotiation. With H.R. 676, all medically necessary care is covered with dental, drugs, long term care—many provisions that most workers don’t have now. Working people would have improved coverage and pay less. That’s why it’s important for unions to take a stand for the best bill, H.R. 676, which would improve care for everyone. Unions today face bitter opposition from attacks on workers’ rights to organize and bargain. Unions can take the offense by leading the fight for H.R. 676. By winning secure health care for everyone, unions will restore hope and confidence in the labor movement and open the door for further gains.